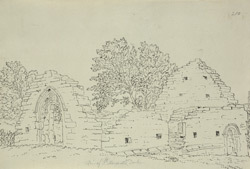 An outline view in ink of the ruins of St Margaret's church in Tanfield near Durham. This was the second church to be built on the site. It suffered terribly at the hands of the Curate of Tanfield, who in 1736 sunk a coal pit in the churchyard and dug a drift mine under the church itself. He hoped to make a private profit from his endeavours. A legal enquiry was held and the mining was halted by decree. However, it had caused so much structural damage that a new church had to be built nearby in 1749. With the addition of a 19th-century tower, this is the church that stands on the site today.